In today’s post: Learn how to make mini donuts at home in under 15 minutes! Easy cake mix donuts recipe. Donuts! Last year for Christmas I got a Mini Donut Maker <—affiliate link , and we’ve been a little donut crazy ever since. It’s so easy to use, and it’s nice to be able to make mini donuts that are baked instead of fried. And since we discovered you can make donuts in any flavor you want in under 15 minutes using a cake mix, we were hooked. My 13 year old regularly mixes up the simple recipe and bakes up a couple dozen mini donuts all by himself so he can share them with his friends. Kids go crazy for these, and since they are so much faster to make than cupcakes, they’re a great choice for birthdays, etc. 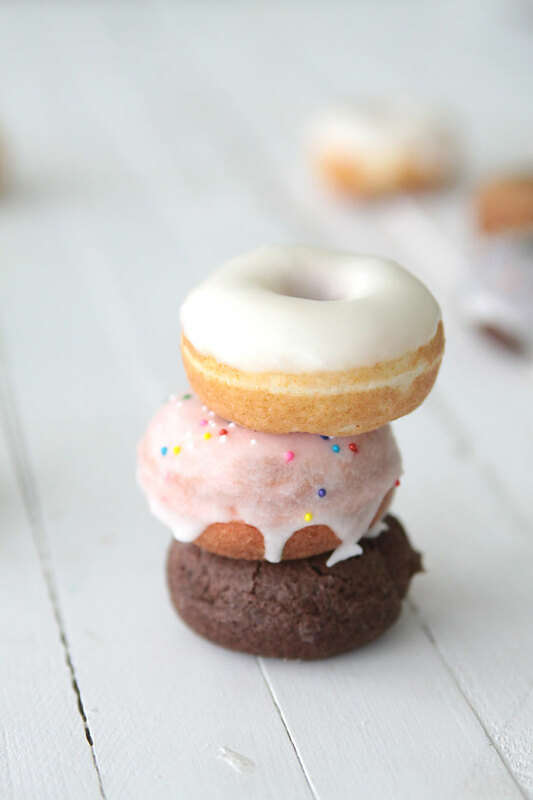 To make mini donuts, you will need a mini donut maker like the one I have or a mini donut pan. Next, you’ll need a great mini donut maker recipe. 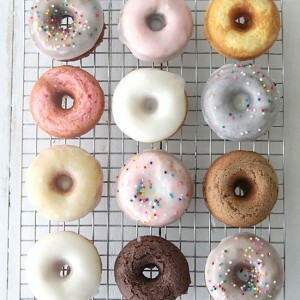 The easy recipe I use starts with a cake mix, which means you can make mini donuts in any flavor you can find a cake mix in: chocolate, strawberry, lemon, white, etc.! We found a spice cake mix last week and the donuts made from it were absolutely delicious, especially when topped with a simple glaze. Like I mentioned, it only takes about 15 minutes to make a full batch of mini donuts (24-30) using the Mini Donut Maker . I’m sure you could also use this easy recipe in a donut pan to bake full size donuts in the over, however, I haven’t tried it yet myself. Now, before I give you the recipe I will say this: cake mix donuts don’t taste exactly like donuts you’d buy at the store. Since they are baked instead of fried the consistency is a little different, although they are quite similar to “cake donuts”. The taste varies depending on the cake mix you choose. Once all 6 wells are full, close the donut maker and wait 3 minutes. Open it back up and use the included fork to remove the donuts from the maker and allow them to cool. Whisk in 1.5 cups of powdered sugar and about 2 tablespoons of milk (start with less milk and add a little more as needed). The glaze should be somewhat runny, as you see below. 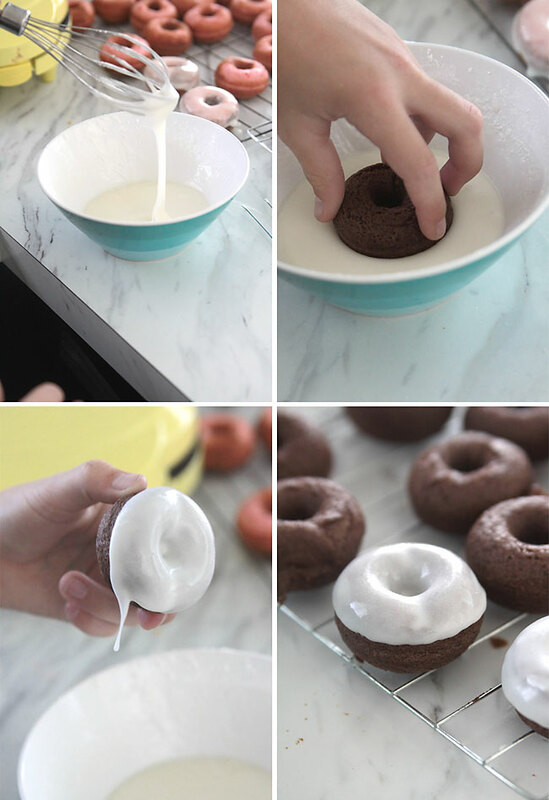 Dip the mini donut halfway into the glaze, then turn the donut sideways to allow extra glaze to run off. Let the glazed mini donut firm up on a cooling rack, adding sprinkles immediately if desired. After a few hours, the glaze gets firm enough so you can stack your cake mix donuts on a plate without smooshing. You’ll need to experiment a little with how thick or thin you like your glaze – thin glaze dries fairly clear, allowing the color of the donut to show through, while thick glaze stays opaque white. If you want pretty donuts, allow them to cool completely before glazing – the glaze doesn’t look as nice if it melts on a hot donut. But hot donuts taste great, so if you want to glaze and eat them immediately, go for it! 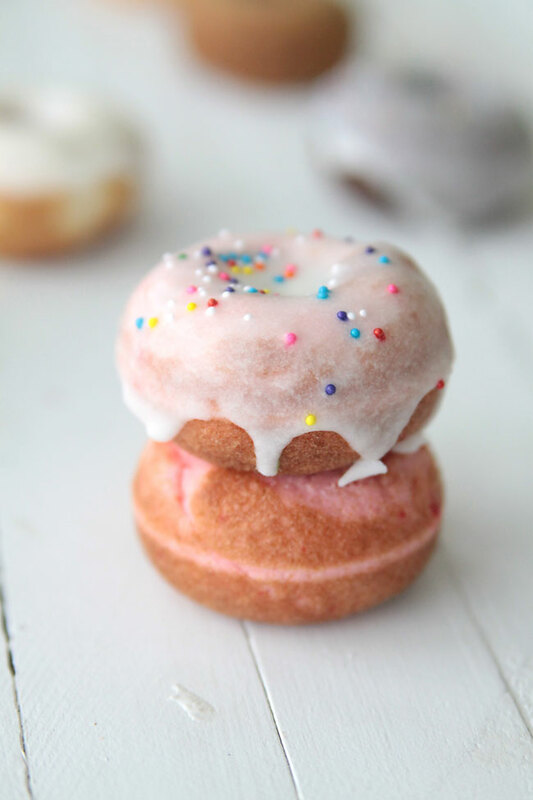 One last note, the donut maker will lightly brown whatever edge it comes into contact with, so if you are making strawberry donuts and want the tops to look pink, not brown, you should slightly under fill the wells so the tops don’t completely touch the unit while cooking. We went hog wild last week and make 10 dozen mini donuts using 5 different cake mixes – and even when making that many it took us less than 2 hours. Fun! « How to make a pleated midi skirt pattern in any size! after your post I ordered the mini donut maker … just arrived yesterday!!!! can wait to give it a try. I hope you enjoy it! Thanks for commenting. I had bought one a week ago and it came yesterday. So I googled donut maker doughnuts and couldn’t believe how many came up. 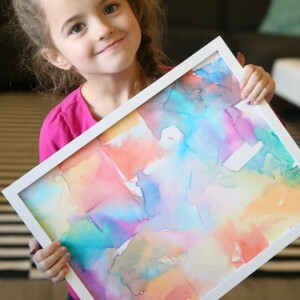 So I was going though and found yours and I really liked the way you have how you make them and your write up. I’ll be excited to make them, so thank-you. I’ve really needed to do something with my dad in the holidays, so he doesn’t think I’m sending it on my iPad watch videos and playing, instead of hanging out with him. Some of these pins are really going to help not being in my room all the time and actually doing something with my dad. And of course, getting creative ? Where did you order the donut maker from? You ca get it online from Walmart, Amazon or EBay. I got mine off of EBay. Love it too. 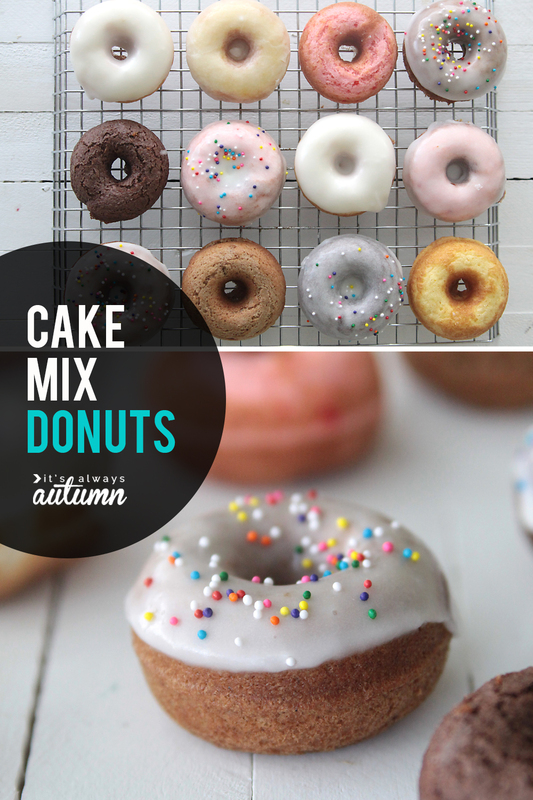 So simple – I may have to order a donut maker! I’m wondering if you could substitute some other liquid for the water; maybe apple cider if you’re using a spice cake mix? definitely! that’s a great idea – I bet it would be delicious! Maybe try a mini bundt pan. You can find them individually or 6 in a tray form like a muffin tin. Wilton also sells donut and mini donut pans. Places like Michaels actually carry both mini and full size donut pans you can bake in the oven. I use full size donut pans and the recipe works very well. How long do you bake them in the oven for using a full-size donut pan? And on what heat? I did mine on 350..it took about 20 minutes or so depending on the cake mix..chocolate cooked faster then blue velvet. I am making funfetti right as we speak in a silicone donut pan. My kids love them and when made ahead, they make a quick and delicious breakfast..especially drizzled with the icing! Sorry what is a Brookfield pan? might be abit to much sugar ( unless unsweetened juice ).. 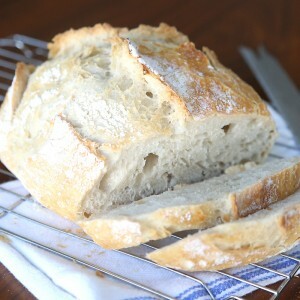 I noticed in mine that if sugar is to high they burn or will not come out of the baker easily. perhaps add a little flour to offset the sugar might well work. Do not use spray-on oil in a baker pan that has a non-stick coating. Over time the chemicals used to make the spray come out cause the non-stick coating to deteriorate. Instead, use a paper towel or heat tolerant hair brush to wipe oil onto the cooking surfaces of the non-stick donut pans. Oils with a high smoke point work best, such as avocado oil. I used a mini bundt cake maker, “Fluted Cake Maker” by Sensio Bella 13579. These are 3″ donut sized cakes in fancy designs. Other reviewers taught me to cook the fancy fluted side three minutes. (By this time the batter is getting ready to start burning the fancy side.) Then use oven mitts and flip the donut baker machine onto it’s back. (Be sure to put an oven safe platter or some other insulation between your baker machine and your counter top). You want to flip it over before the fancy side starts burning, or immediately when you start to smell burning. After you flip the machine on it’s back, the fancy part will release from the mold, so it doesn’t burn. Then the plain side falls into the opposite plate and it starts to cook. Finish cooking the plain side another three minutes. If the plain side starts burning, then unplug the machine and stop cooking. Mine were fully cooked and soft using this flipping method. Some donuts don’t have a hole in the middle, because you want to stuff them with filling. Reviewers taught me that if the center of these mini cakes is undercooked, then just put these cakes in the microwave for 30 seconds to finish cooking the centers. I didn’t need to do this. Mine were done after 3 minutes on each side, (for a total of 6 minutes of cooking). I have a mini and large donut pan for the oven and they work great!! You would cook about 7-8 min (mini) and check them…depends on the batter you choose. I’ve done cake donuts and pancake ones. Pancake mix in the donut pan with a little bowl of syrup on the side and the kids love it! Do you just make up the pancake mix as usual to do that? That is a great idea! use for more than one thing! I just ordered 2 donut pans from Wilson. They were $9.99 each. Shipping was almost $9. I googled the other brand and it came up $15. I’m THRILLED BECAUSE I NOW CAN MAKE SUGAR FREE DONUTS WITH A CAKE MIX !!!!! Don’t you think the cake mix has sugar in it? pilsbury offers a sugar free yellow cake mix and a sugar free chocolate cake mix! Where do you find the sugar free cake mixes? I’m thinking about gluten free. I haven’t, but I think one of the other commenters mentioned that it works just fine! I received a mini doughnut pan and a regular doughnut pan and just baked 2 dozens and they were great! It only took 12 minutes and my grandson could help out too! I tried your recipe today. Either I did something wrong or the recipe is on for oven cake mix donuts. They came out super soft and crumbled everywhere. Too much water? Help! My mother in law gave her two donut pans and I would really like to use them properly. I tried using cake mix to make mini donuts in an oven pan and it was way too fluffy.. i couldn’t even get it out of the pan without having it crumble to pieces. any tips?? would using milk instead of water make it denser? or is that gross? Winnie, Did you follow the directions on the cake mix box or what was written on this site? Just wondering as I’m planning on making these. Thank you for this post. This is perfect for my daughter’s 2nd birthday party we are having in the morning.! Any idea how long the donuts last once they are made? I would like to make in advance. Thanks! Hi! I wanted to make these treats today in my donut pan for the oven! What temperature do you recommend I use? I baked the doughnuts at 400 degrees and it worked great! Oh boy, these look dangerous! Love how simple they are. Might have to make these this weekend, and do extra cardio at the gym! I have a donut hole maker and was wondering if you could use this recipe in there? I also have the donut pans for regular full size donuts and was wondering the same thing as to whether I could use these pans and for how long would I have to bake the donuts. Thanks for the great recipe. What a great idea! I have a mini donut maker and hardly ever use it because the mixes are expensive. My girls love mini donuts, and can have them all the time now. Thanks! I love this idea. Now to see if I can find a mini donut maker here in England. Cake mixes come in a myriad of flavors and are so inexpensive, these would be great for a bake sale! This is really helpful. They look delicious…. I don’t have all of the ingredients right at this moment, but one day when I have them all I will definitely make this recipe. Last year when I saw your post, I almost asked for a donut maker for Christmas. I found one at a Church rummage sale for a dollar. I had not even been used. They had three of them. Can’t wait to try out your recipe. Thanks for sharing this with us. Such beautiful and tempting pictures to go with the recipe! The trouble I am having with baked donnughts is they all seem to taste like a cupcake but in the shape of a donught. Do these taste like donughts? They certainly look great! Hi Rachel! When these are hot and fresh they taste more like a donut, and once they are completely cool they taste more like a cupcake. I guess there’s just no way to get that donut flavor without actually frying them 🙂 but I think when these are warm they’re pretty close! I was wondering if these would work if you made them into balls and dropped them in a fryer? What do you think? I’m really not sure. The batter is pretty soft so you couldn’t really shape it into a ball… I guess you’d just have to experiment and see what happens. If you do, come back and let us know! Dropping liquid cake mix into frying oil reminds me of funnel cake. Maybe this would work better if you used a funnel cake recipe. Wanna try this. Thank you for this idea. I purchased a mini doughnut baking pan here in Australia some years ago and have never used it because I lost the recipe that came with it. I have seen it from time to time haven’t kept it aside. If I find it again, I will post the recipe on here. I can’t remember the ingredients or wether it is similar to a cake recipe. I might be some time getting it put on your page as I’m going away soon and may not have time to get it on. I have a mini donut msaker. Kohls sells them. I make these all the time. 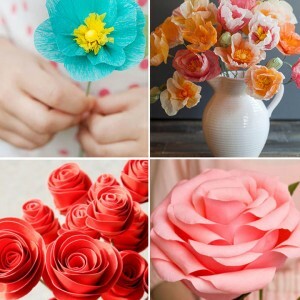 Going to make some tomorrow. Walmart has a mango cake mix I’m excited to try. How long would I cook these in the oven in a donut pan? don’t know what kind of cKe mix you are using but I just tried this in a regular donut pan me the cake mix is so light that the donuts all fell apart, all I got is drums. What a mess. Will try again. It have to find another mix. just got a mini donut maker, and need to do Gluten Free donuts. I love the recipe with the cake mix egg and water. Wondering if you could use applesauce instead of the water? I don’t have the doughnut maker but the pop/doughnut hole maker. This worked just as well. My husband loved them. So did the ladies a work with! Thanks for this fun recipe. do I have to use a packet cake mix or can this be done with fresh ingredients? I picked up one of those mini donut makers at a thrift store for $4. Best $4 I’ve ever spent! And now that I know we can use a cake mix in that baby I think we’re going to go a little nuts for my kids’ bake sale next weekend! Just wondering, how did the bake sale go? What flavors did you make? Which sold best? I was thinking of making these for a bake sale too. Needed a recipe for using my donut baker. Used this recipe with a pumpkin quick-bread mix. Turned out deliciously! Dipped them in cinnamon-sugar. They taste just like Tim Horton’s Pumpkin-Spice donuts, only cheaper! Thank you for the recipe. I also used the pumpkin quick-bread mix to make the lightest pancakes–superb! I watched my brother make these for his wife’s church group about 3 years ago. The only thing I saw different was that his doughnuts turned out a lot flatter and not as rounded as in the picture. They did taste pretty good though. Not like a regular doughnut but more like the cake. I can’t get the machine here so I will use mini bundt pans to try the recipe. Thanks for the post ans the comments. Pans with non-stick surfaces (such as Teflon) have to be “seasoned” before you can eat food out of them. The first time you heat them up, they will burn off some chemicals that smell like plastic. Heat it up at full heat for a few minutes, with the windows open. A POWER light should come on whenever the baker is plugged in. These bakers are cheep. Most of them do not have an “On/Off” switch. You plug it in to turn it on. You unplug it to shut it off. When it is plugged in, the POWER light goes on and the plates immediately start getting hot. Once you unplug it, the POWER light shuts off and the plates start cooling down. After you plug it in it will heat up. Once it is fully hot, a second light will change. Either a second light will come on; or if the second light was on in the beginning, it will shut off. The changing of the second light indicates that the pans are hot enough to cook on. When you are first “seasoning” your pans, you are burning off the top layer of chemicals that are there from the manufacturing process. Once the second light changes, the plates are fully hot. Let the pans stay hot for a few minutes to burn off the chemicals on the surfaces of the plates. (It should take no more than 15 minutes for the chemicals to burn off.) When you no longer smell stuff like burning plastic coming off the plates, then unplug it. Let it cool down. Do NOT use oil “sprays”, that come out of spray-cans, on non-stick baking pans. The chemicals in the spray will deteriorate your non-stick surfaces over time, and the pans will start sticking if you use sprays. Instead you should brush on ordinary liquid bottled oil. You should get a cooking brush that tolerates high temperatures. Use this brush to add oil to your pans. Use an oil that has a high smoking temperature, such as avocado oil. You can google other oils that don’t smoke unless they are at very high temperatures. Try to find an oil that does not make smoke unless the temperature is very high, like over 425 degrees F.
Make a “dummy” “sacrificial” batch of donuts for the first time that you use your baker, that you will be throwing away. Use a cheep batter that you do not mind throwing out. I used pancake batter for my “sacrificial” first use. The sacrificial batch will absorb any remaining bad chemicals that are coating the surface of your baking pans. It also gives you a chance to see how long it takes for your unit to heat up. It also gives you an idea of how long it takes to thoroughly cook the mini sized food in your baker. Throw out the sacrificial first batch of donuts. Let the machine cool down. To clean non-stick surfaces, only use soft things like soft sponges. Only use gentle soaps, like liquid dish soap. In between batches of donuts, you can wipe the surfaces down with paper towels. You can spread new oil on the pans with a paper towel, a rag cloth, or a heat tolerant cooking brush. Always add oil on your cooking pans for each batch of donuts you make, so that they are easy to remove from the pans. Always add oil to the pans for each batch of donuts that you make, so that the pans are easy to clean and do not become scratched. Never use metal to remove donuts from the pans. Only use wooden tools (like chopsticks or wooden spoons), or use heat tolerant plastic tools that are designed for non-stick baking surfaces. Never get the electronics wet. Never submerge your electric baker in water for cleaning. After hand washing it (with a sponge or towel) make sure it is thoroughly dry before plugging it in again. Now you are ready to start cooking for real. Now you have an oil that doesn’t smoke. Now you know how long it takes to pre-heat your baking pans. Now you know how long it takes to cook the batter through to the middle. Enjoy your baker! Angel food cake has been recommended for light fluffy donuts. I like brownie mix for a heavier chocolate donut. You can make Bisquick mini cakes in these too. They’re great for breakfast. I tried these in doughnut pans and they did NOT work. I baked them on 350 for 25 minutes before they were baked through, but they would not come out of the pan and just crumbled apart (I greased the pan beforehand). 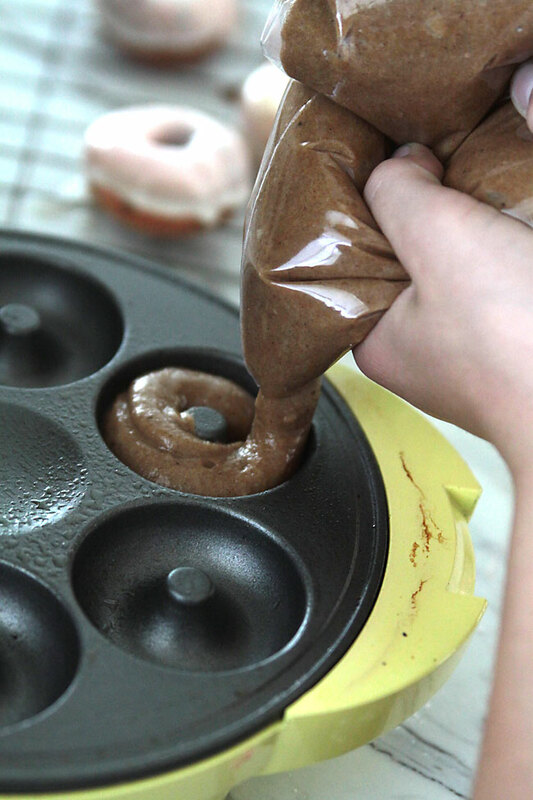 Tried this in my silicone mini donut pan. Crumbled to bits. I followed the directions as given here. It sounds like it’s much more successful in a donut maker. I’ve been craving donuts, went on a Pinterest search, and these are sooooo good!! I made them with a gluten-free, dairy-free cake mix (Pamela’s); followed Autumn’s recipe here, and they were absolutely delicious!! I glazed them with a powdered sugar, vanilla extract, and almond milk combo so they’re a sweet treat the whole family can enjoy. Thank You!! How to store the glazed doughnuts? How many hours can it last to be in shape & taste? What’s the lifespan of the doughnuts? How do I to store the glazed doughnuts? How do I store the glazed doughnuts? I can’t wait to try this with gluten free cake mixes!! My mom will love it! I always add different flavors to her cake mixes. This will be a fresh new treat. Awesome ? We’ve had a mini donut maker collecting dust because it seemed like too much effort for these tiny donuts, but these take no time! Thanks for sharing! Made this tonight with donut baking pans for my son and daughter’s 10th birthday tomorrow. I did yellow cake first and it was a bit running for my taste but the donuts came out okay. Once they were cool they were firm enough to handle. The chocolate donuts I did the same recipe but I added extra flour to this batter and they came out more dense but still great. I think both batches came out well and my kids will be quite pleased in the morning. Thanks for posting this easy recipe! This does not work with Betty Crocker cake mix in Wilton pans. The cake is way too soft still and I followed your exact instructions. I’m a “from scratch” baker most of the time but wanted something quick for my son’s school party Tuesday. I’m so glad I did a test run on these because they all fell apart even after waiting for them to cool and being very gentle handling then. I think the donut maker is the only way these will work. Thank you so much for this recipe! I bought a cake pop maker for my daughter in law at Christmas a few years ago and picked up a mini doughnut maker for me on a whim. Used it once and they came out like hockey pucks. Made them this way tonight with a yellow cake mix, cooked them for one and a half minutes. Light and fluffy a little crisp on the outside. Little pillows of delight! Hi, I have tried these with locarb sugar free cake mix and for the frosting the sugar free frosting I add a bit of water to it to get a glaze they turn out great!! wanted to make Cinnamon doughnuts in my mini doughnut maker. Hoping to be like you find at the carnival. What cake mix you think would work best? Gown long do you bake them in an oven & at what temperature?